Marvel at the privileged views over the longest fine sand beach on Mykonos from this luxury hotel. An illuminated rustic façade of Cycladic stone is the stage curtain to contemporary interiors and vast entertainment decks conceived by a celebrated Greek set designer who takes his dramatic cues from a blend of antiquity and new age fantasy. Spacious rooms and suites are cool sanctuaries with private balconies or vast terraces and appointed to the highest standard of comfort, with the option of your own infinity pool or Jacuzzi. Relax in the superb hotel spa or explore the the local sites on the island at the recommendation of the hotel concierge team. Enjoy the contemporary elegance of an open plan room appointed in natural tones and textures, leading onto your private balcony with spectacular sea views. Includes king-size or twin beds as well as a comfortable sofa and a designer bathroom with shower or free-standing bath. Standard amenities are complemented by a flat-screen television and staples of luxury toiletries. This room is also available with a Jacuzzi. Ideal for three adults, or two adults and two children up to 12 years old. The most distinctive accommodation at Royal Myconian resort captures the essence of refinement and intimacy on a grand scale. In this spacious suite of 70-80m2 the comforts of a bedroom with king size or twin beds and a bathroom with shower and an elegantly furnished living room of 35-50m2, consisting of 2 sleeping sofas and a second bathroom with shower facilities, are enhanced by the oversized furnished terrace with private pool and breathtaking views over the Vast of Aegean. Ideal for three adults or two adults and two children/teenagers up to 17 years old. 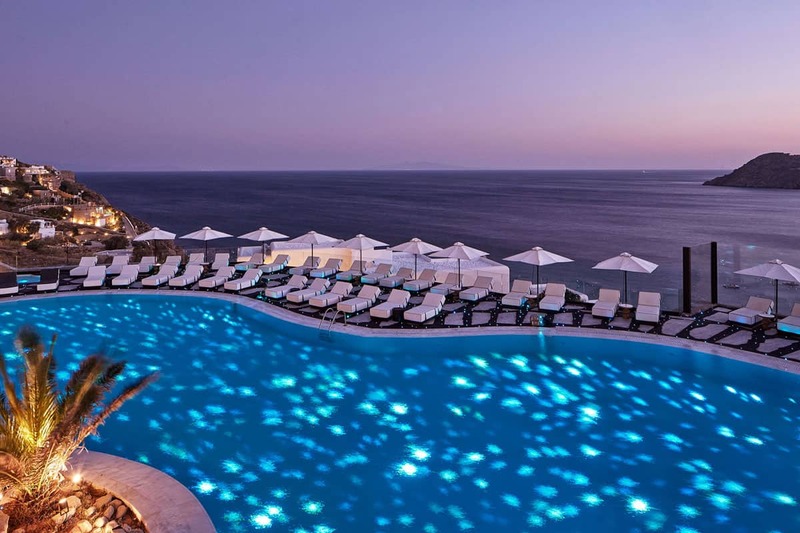 This 5-star hotel in Mykanos boasts outstanding amenities that include a panoramic pool deck, a superb spa, state-of-the-art conferencing facilities and, of course, restaurants that celebrate the gourmet experience on which the Collection prides itself. The spacious rooms and suites are cool sanctuaries with private balconies or vast terraces and appointed to the highest standard of comfort, with the option of your own infinity pool or Jacuzzi. As night falls, head out to the elegant Ambrosia restaurant to enjoy an à-la-carte menu of unaffected simplicity and a few gastronomic surprises, all of which are an expression of the passionate culinary team’s philosophy that nothing is done purely for show. Sea views and candlelight enhance the distinctive culinary experience. Our executive chef George Oikonomou uses local organic produce and the daily catch delivered fresh off the boats to pay homage to Mediterranean cuisine. With such ingredients at hand, it is no wonder that he values pure and authentic local flavours. Weakfish with tamarisk and Kakavia soup highlight the essence of his philosophy, though he also recommends the lobster for its exceptional flavour. As a rule, George renews his menu yearly, preserving only a few favourites and adding innovative recipes to express the rich variety of nature’s local bounty. Savour classic cocktails and homemade smoothies served to your lounger by attentive waiters. Or let the ultimate vacation vibe wash over you as you break the surface of the saltwater pool to place your own order at the swim-up bar. Nothing beats al fresco eating at any time that suits you and your holiday whims. Camares serves a delicious selection of fresh salads, light snacks and enticing delicacies to sustain you throughout a day of leisurely bliss spent on the Royal Myconian pool deck. Take your seat at one of the poolside tables under a parasol, or settle into the inviting alcove of roughhewn stone from which you can survey all of the action and the superb views. This is the perfect perch from which to admire the breathtaking sunset before moving on to Ambrosia. As dusk fades into a star-spangled night, settle back into a sofa on a panoramic terrace while considering your Myconian night’s many options and sip sundowners shaken and stirred by the expert barmen. A firm favourite is the refreshing “Ancient Martinez”: Tanqueray no10 Gin, Antica Formula Vermouth, fresh apple & grapefruit juice, red grapefruit bitters and a twist of ground salt.